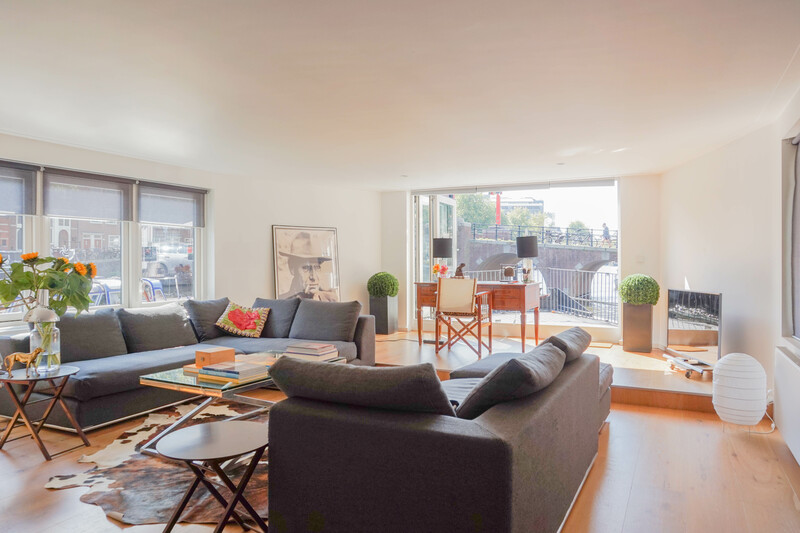 Luxurious, modern and brightly renovated houseboat (approximately 227m2) located on one of the oldest characteristic canals in the City Centre of Amsterdam. AVAILABLE FOR A MAXIMUM OF 6 MONTHS. Hallway, separate toilet, spacious living with a fireplace and French opening doors to the outside deck facing South-West, spacious second living/ dining with a modern fully equipped kitchen. Staircase to the landing on the lower deck with a large master bedroom and a large walk-in closet, Laundry with a washing machine and dryer, bathroom with a bathtub, separate shower and a toilet and 3 extra good sized bedrooms. The houseboat is located in one of the oldest and characteristic part of Amsterdam. There are many shops, bars, restaurants and cultural highlights close by. Public transport to several directions is on a walking distance.